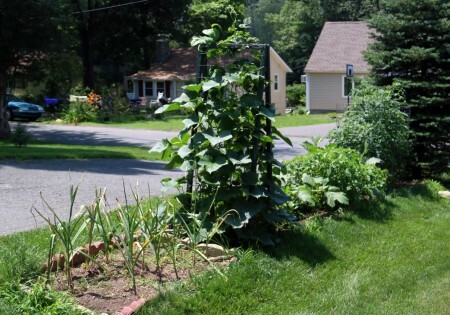 While living in Boston years ago, I became an avid viewer of a popular gardening show aired on Public Television and hosted by master gardener Jim Crockett, and later hosted by Bob Thomson. Both Crockett and Thomson wrote detailed and informative books on gardening titled Crockett’s Victory Garden and The New Victory Garden, respectively. My wife and I were apartment dwellers while living in Boston and had no chance of starting a garden, but I bought and read both books, hoping that some day I would be able use this knowledge. This laborious trench was my opportunity to start my first garden. After laying the pipe, I started working on the garden. Using my copies of the Victory Garden books as guides, the garden was ready for an initial planting by June of that year. The planting space measures a mere 90 square feet, but it has proven adequate for my purposes. 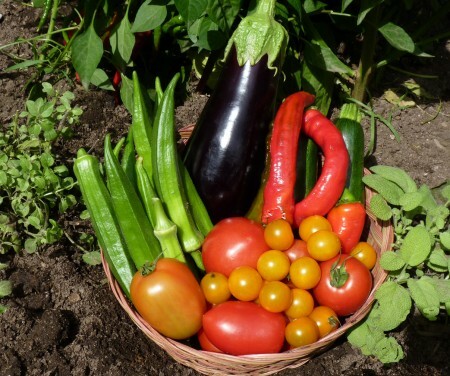 Every year my garden produces plenty of fresh vegetables that I can harvest and serve fresh and I have plenty left to can and freeze for meals during the cold months. 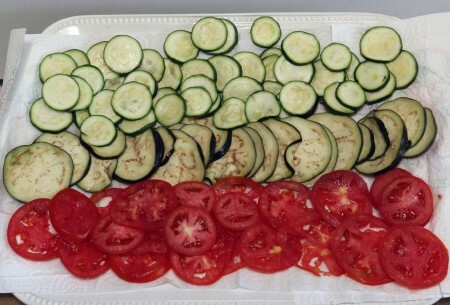 One of our favorite summer side dishes is the vegetable tart featured in this post. The crust that I use for this tart is the only constant in the formula. The filling depends on what the garden is offering at the time. I made the tart featured in this post this past Sunday, after filling the basket shown below with whatever was available. For this tart I used the eggplant, zucchini and some of the tomatoes. I pickled the okra and dried the cayenne peppers. 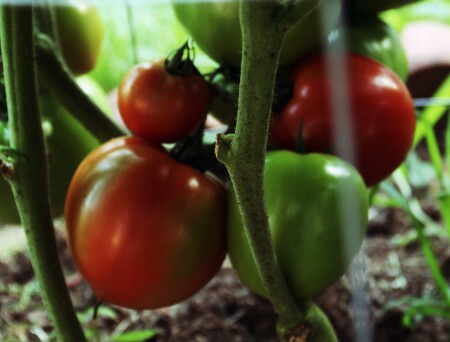 Mountain Fresh Tomatoes: These disease-resistant, firm and flavorful tomatoes are a standard in my garden. They are delicious eaten fresh and are great for canning. Below is my first successful attempt at producing this tart. I filled it with the same cheese mixture as the one featured here, but used part of an abundant crop of tomatoes as the only vegetable/fruit. 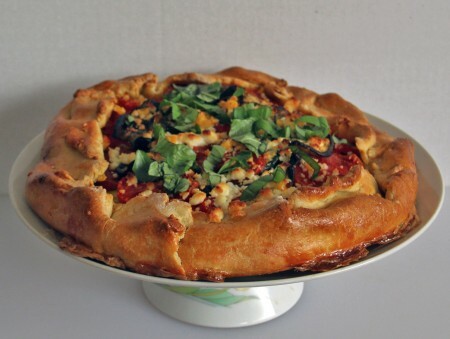 I have used both masa harina and regular corn flour to make this crust. However, I prefer the masa harina because the process used to make it mellows the corn flavor, which, in my opinion, allows the flavor of the fresh vegetables to stand out more. Combine the flour, masa harina and salt in the bowl of a food processor and pulse two or three times until combined, add the butter and pulse until the mix resembles a coarse meal. Transfer this mix to a suitable size bowl and set aside. Do not wash the processor bowl. Combine ½ cup of corn, lemon juice, lemon zest, goat cheese and cream cheese in the bowl of food processor and process until smooth. Return the flour mixture to the processor bowl and pulse several times until the dough starts to come together. Scrape down the bowl with a rubber spatula and distribute the dough evenly around the blade. Continue to pulse until the dough comes completely together, about 5 or 6 quick pulses. Transfer the dough to a well-floured work surface and press into 8-inch round disk. Wrap the disk in plastic wrap and place it in the refrigerator while you prepare the filling. Place an oven rack in the middle position in the oven, and place a pizza stone or a large cookie sheet, reversed, on the rack. Preheat the oven to 400 degrees Fahrenheit one hour before the baking the tart. The three vegetables that are the heart of this filling contain a lot of excess water. Most of this water must be removed before final assembly and baking. If not, the heat of the oven will extract this excess water from these vegetables and be soaked up by the pastry shell, making it dense and wet. Salt causes each of these vegetables to release water. We will be sauteing the zucchini and the eggplant before incorporating them into the tart, and this extra step helps these vegetables saute and brown rather than stew in their own juices. 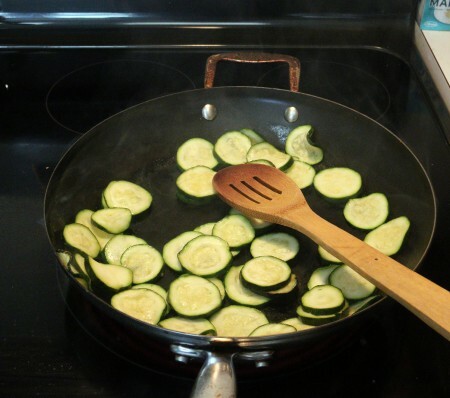 Place the zucchini slices in a colander and sprinkle them with 1 tsp. of non-iodized salt. Set the colander over a suitable size bowl until about 1/3 of a cup of water drains from the zucchini. This will take about 30 minutes. Rinse the zucchini with cold water and dry on a double layer of paper towels. Repeat the above process with the eggplant but do not rinse, just place the eggplant on paper towels to dry. Arrange the tomatoes in a single layer on a triple layer of paper towels and sprinkle with 1 tsp. of salt and let them drain for about 15 minutes. Remove any residual moisture by gently blotting the tomatoes with another layer of paper towels. In a 12-inch, heavy bottom, non-stick skillet heat 1 tsp. of vegetable oil over medium high heat until it just begins to smoke. Add the zucchini and saute, stirring constantly, until it just begins to brown. Place it on a layer of paper towels and set it aside. NOTE: Like a stir-fry this step uses a hot pan to just sear and brown the vegetables, not cook them through. Repeat the above process with the eggplant. 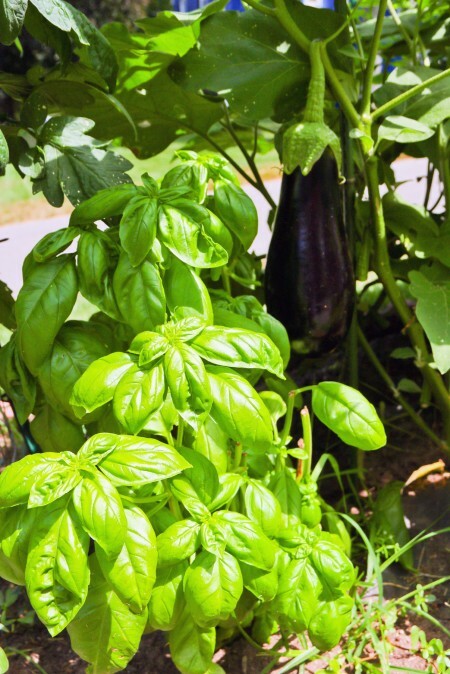 Combine ¼ cup of fresh basil, fontina cheese and fresh oregano, and set it aside. Combine 2 tbsp. of the fresh bread crumbs with the ½ tsp. kosher salt, and set it aside. Remove the crust dough from the refrigerator, place it on a well-floured piece of parchment paper and roll it into a 14-inch circle. Carefully transfer the rolled dough and the parchment paper to the back of a large cookie sheet. If you are lucky enough to own a pizza paddle, this task will be easier. Arrange the cheese mixture on the rolled-out crust, leaving 1½-inch space at the border. Sprinkle the fresh bread crumb and salt mixture evenly over the cheese. Arrange the zucchini and eggplant in a way that you find appealing over the cheese and sprinkle with the remaining breadcrumbs. Arrange the tomatoes in overlapping slices over the bread crumbs, and sprinkle with the remaining ¼ cup of corn. Fold the edges of the dough toward the the center of the tart, pleating and sealing. Brush the tart shell with the egg wash mixture and place it on the pizza stone or reversed cookie sheet, in the oven to bake for 15 minutes. 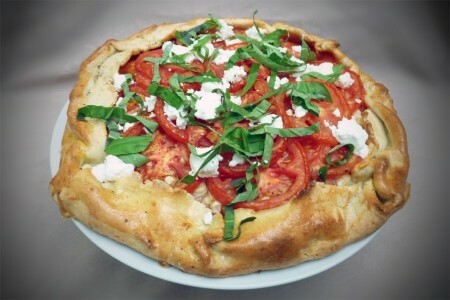 Open the oven and carefully top the tart with the remaining goat cheese, and continue to bake for 3o minutes, or until the crust is a rich brown. Let the tart rest for 15 minutes before serving. In 1955, a Hawaiian chicken farmer named Ernie Morgado served barbequed chicken glazed with his mother’s homemade teriyaki sauce at a local farmers’ gathering. This chicken soon became one of those great “only-in-Hawaii” popular foods. The chicken was such a hit that Ernie soon found himself in great demand at fundraisers and other events. He hired crews and launched a catering business using specially designed barbeque grills mounted on trucks called “huli wagons” that held the chicken between two grates. This system allowed the chickens to be turned frequently so they would cook evenly. When the chickens were ready to turn, the workers would yell, “Huli” (“turn” in Hawaiian). In 1958, Morgado registered his sauce with The Territory of Hawaii and named it Huli-Huli. Street vendors selling BBQ chicken by that name all but disappeared after Morgado asserted his rights to the trademark, and started marketing bottled sauce under that name. 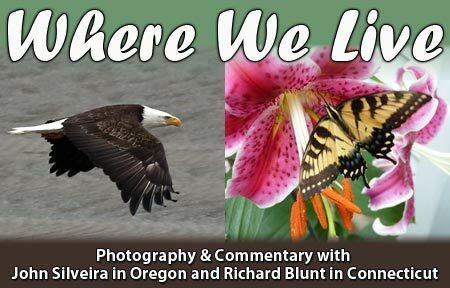 When my daughter, Sarah, was vacationing in Hawaii a few years ago, she and her traveling companion, Heather, caught the scent of some great-smelling smoke while walking along a beach. They followed the smoke to a large roadside grill selling barbequed chicken. It wasn’t called Huli-Huli chicken, but the vendor assured her that it was the same chicken using his customized recipe. 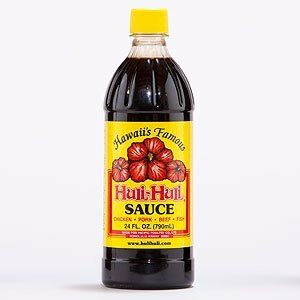 When Sarah came home she brought a bottle of Huli-Huli sauce that she bought from Amazon, handed it to me and said, “You have to make this chicken; it’s great.” During the months that followed, I experimented with the concept, using the bottled sauce and several recipes that I found online. Unfortunately, brushing any sauce on chicken while it’s cooking adds little flavor and increases the possibility of burning. 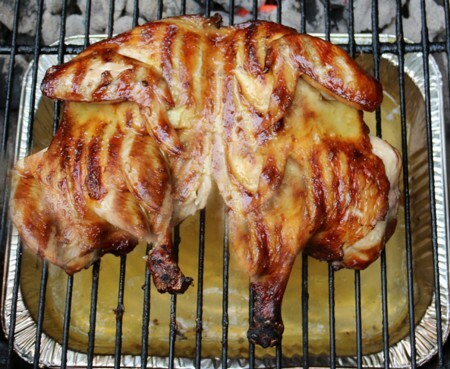 It isn’t practical to repeatedly turn a chicken being cooked on a charcoal grill. Even the high-end gas grills with electric rotisseries don’t work when you try cooking a chicken using a recipe like this one. However, if you make the cooking surface modifications that I suggest here, you can prepare this recipe using whole or split chicken or chicken pieces. I have cooked the three cuts several times each with predictable results. After suffering several unpleasant chicken grilling events and graduating from grilling hamburgers, hotdogs and steaks over charcoal to barbequing larger meat cuts like spare ribs, whole chickens, pork, beef and lamb roasts, I knew that changes to the grill and to my cooking methods would be necessary, especially with this recipe. 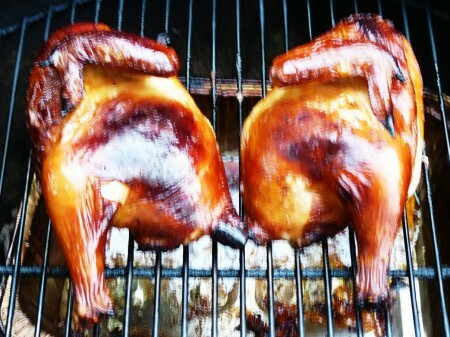 Cooking chicken directly over burning charcoal, even turning it frequently, results in severely burned and charred flesh. After cooking this chicken a couple of times this way, I decided to switch to a method using indirect heat. 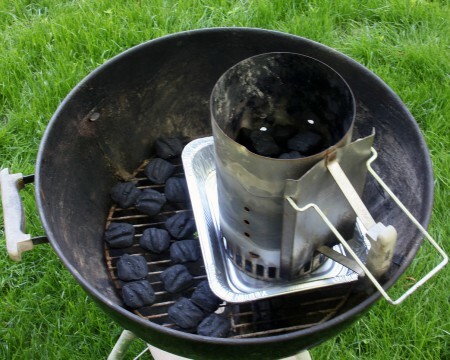 The photo below shows a modified two-level charcoal setup that I now use when barbequing a whole or split chicken. The high temperature generated by burning charcoal in a confined space like a kettle grill will (if not managed) dry out and burn most foods. In order to prevent drying and to infuse the chicken with more flavor, I decided to first soak the chicken in a flavored brine for several hours. To give my chicken a seasoned-to-the-bone-flavor, I added soaked mesquite wood chips to the fire just before placing the chicken on the grill. Mesquite is not a recommended wood for smoking foods for more than one hour. After an hour, the smoke turns food bitter. However, it works well with this quick-cooking recipe. Finally, for flavor consistency, I also duplicated some of the ingredients in the glaze that were used in the brine. The glaze is then reduced to about ½ cup and brushed on after the chicken has been transferred to a serving dish. This sauce is not readily available in many parts of the country. I don’t think that buying it is necessary, because there are many interesting recipes for this sauce available. 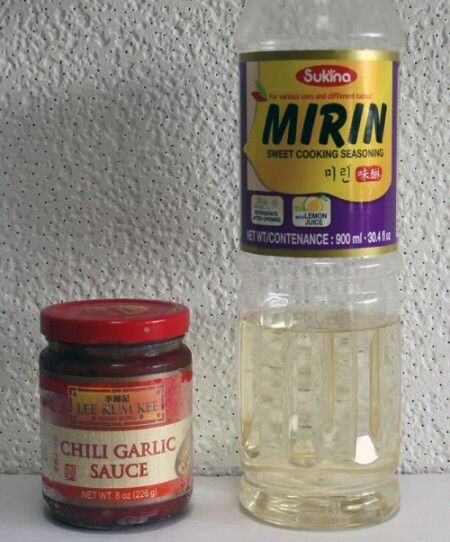 Chili garlic sauce and mirin (a sweet Japanese cooking wine) can be purchased in most large supermarkets that have an ethnic grocery section. The warm heat of the chili sauce and the subtle sweetness of the mirin add complementing flavors to the glaze. I have prepared this recipe using split chicken halves and whole split chicken. Also, chicken can be cooked skin side up or down depending on which presentation you prefer. Skin side down imparts a classic grill mark. Combine the brine ingredients, add the split chickens and refrigerate for minimum of 4 to a maximum of 8 hours. Wrap the wood chips in a suitable size piece of aluminum foil. Cut several vent holes in the top and bottom of the package and soak in warm water for one hour. Combine glaze ingredients in a small saucepan. Simmer over medium low heat, stirring periodically, until the glaze is reduced to about ½ cup. This will take about 25 minutes. Cover the glaze and set it aside. Remove the chicken from the brine and dry it with paper towels. Open the bottom vent holes of the grill halfway. Light the briquettes in a chimney starter and let them burn until they are lightly coated with a thin layer of ash. This usually takes about 10 minutes. Empty the contents of the starter onto half of the grill. 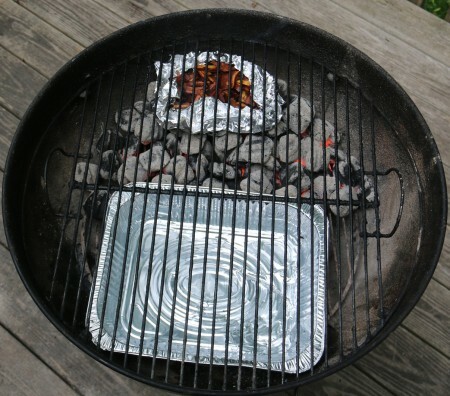 Place the aluminum pan to the now empty side of the grill. Put the cooking grate in place, cover the grill with the lid, and heat the cooking grate for about 5 minutes. Using a pot holder, carefully lift the grate just enough to place the soaked wood chips on the coals. Using the tongs, coat the grate with the vegetable oil-soaked paper towel. 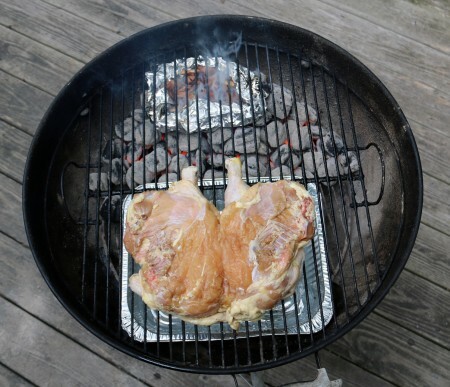 Arrange the chicken, skin side up or down, over the aluminum pan with the legs closest to the coals. Cover the grill with the vent holes open and over the chicken. 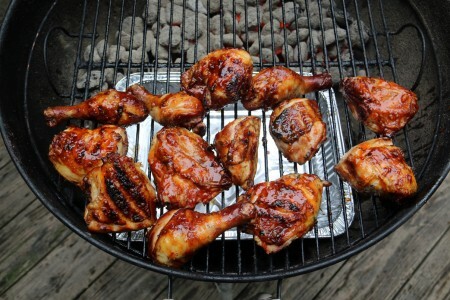 Cook the chicken for 30 minutes, and until the thigh meat registers 125° F. Remove the lid and turn the chicken. Replace the lid and continue cooking until the breast meat reaches 155° F and the thigh meat reaches 175° F.
Remove the chicken from the grill and let it rest for 5 minutes. While the chicken is resting, heat the glaze. Portion the chicken to your liking, brush each piece with the warmed glaze and serve. I admit that this recipe is a busy one but if dry grilled chicken coated with charred BBQ sauce is getting old, give this recipe a try. You will be glad that you did. My mother loved barbequed pork ribs but, like many her favorite foods, they had to be prepared to her liking. When it came to ribs, she had no taste for what she called “sticky finger, dribbly-chin ribs that come off the grill or smoker with the meat falling off the bones, and smothered with that sticky sweet sauce.” Her favorite BBQ rib was the the dry rub variety coated with herbs and spices and slow cooked in a smoker until the meat was tender and juicy, while still retaining a delicate chew without the meat falling off the bones. Every summer for several years we were invited down to the town of Mashpee, on Cape Cod, to stay with friends for a few days. One of the meals during our stay usually consisted of these ribs with side dishes of hardy greens like collards or kale (cooked southern style), and Hoppin’ John — a dish made with black- eyed peas and rice and served throughout New Orleans on New Years’ Day. For the past several years I have experimented with various recipes and production methods for preparing dry rub ribs. The results, however, have been mixed. There are endless variations of the classic dry rub used to coat these ribs. The classic Memphis-style rubs proved to be consistently the best-tasting. So I made some minor adjustments in spice and herb quantities that suited my taste. That was the easy part of this process. Figuring out how to cook the ribs was a bit more problematic. I don’t own a smoker, and I already own more limited-purpose cooking gadgets than I can store properly when not in use. So I decided to turn my Weber grill into a smoker. I called a chef I had worked with years ago in a popular restaurant in Cambridge, Massachusetts. He shared with me a method that teams my Weber grill with my electric oven to produce ribs that have all of the qualities of ribs cooked in a high-end smoker in half the time. I decided to give this method a try. When you place any food on a hot charcoal grill to cook, you set into motion a series of chemical and physical events that will determine if that food will be edible after it is cooked. Fortunately, there are many reliable methods that you can use to help you monitor and control the cooking process and insure success. The most popular method for cooking food over charcoal is grilling. Grilling usually involves cooking steaks, hamburgers, chicken, chops, or vegetables over an even layer of charcoal. Grilling is a simple and effective method for adding a distinctive flavor and texture to any food. Barbequing is also a popular method for cooking meat, seafood, and vegetables using hot charcoal. The main difference between the two is that grilling incorporates high heat to quickly sear food to lock in the juice, which allows the food to continue cooking without drying out. Of course, overcooking is easy with this method, which will dry food regardless of searing. Barbequing usually involves cooking food at very low temperatures (200° to 300° F) for extended periods of time (8 to 12 hours and longer). This allows for wood smoke to be added to the preparation procedure. But smoking food requires extended cooking times and often marinating or brining, depending on the type of food being cooked. The complexity of barbequing allows the cook to incorporate many variables that will infuse the food with a customized taste and/or texture. In the weeks that follow I will discuss some of these variables and how to use them. The following recipe offers a fail-safe method for any cook with a 22-inch, Weber-style kettle grill to prepare and serve barbeque smoked pork ribs that are both tender and loaded with flavor. Also, this can be accomplished in 5 hours or less with a minimum of fuss. 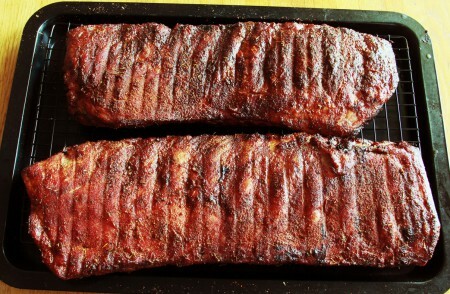 I suggest that you follow my formula when you prepare these ribs for the first time to get an idea if it works for you. Then you can customize it to suit your personal taste and texture preferences. Combine all of the rub ingredients in a small bowl and set it aside. One hour before you plan to start cooking, add 1½ cups of warm water to the wood chips. Remove the ribs from the package and wipe them with paper towels to remove excess moisture. Place the ribs in the rimmed cookie sheet and coat both sides of the ribs with the spice mixture. Press the rub firmly with the palm of your hand to insure that it sticks to the ribs. Set the ribs aside. Mix the ingredients for the mop and set it aside. I have specified when and how much of this mixture to use during the cooking process. It is important that you do not exceed what I have specified. Excess moisture added to the ribs while cooking will result in what pit-masters call “stall.” In other words, the extra moisture added back to the ribs will stop (stall) the cooking process until it evaporates. This can add as much as an hour to the cooking process. Prepare the grill by setting it up according to the photo below. Open the bottom vents halfway. Place 15 briquettes on one side of grill and the remaining briquettes in the chimney starter. The aluminum pan under the starter in the photo there to give you an idea of its exact size. Place it in that location with about an inch of water added when you are ready to cook. Light the briquettes in the chimney starter and let them burn until they are lightly coated with a thin layer of ash. This usually takes about 10 minutes. Empty the contents in the starter onto the unlit briquettes. Place the aluminum pan with one inch of water added to the now empty side of the grill. Put the cooking grate in place, cover the grill with the lid, and heat the cooking gate for about 5 minutes. Sprinkle half of the drained wood chips over the coals. Place the ribs, meat side down, on the cool side of the grill, cover the grill with the open top vents over the ribs, and cook for 45 minutes. Flip the ribs to meat side up, and switch the positions of the slabs. The slab closest to the coals moves to the rear and the other slab moves to the side close to the coals. Distribute the remaining wood chips over the coals. Brush the meat side of the ribs with about two tablespoons of the vinegar/cider mix and continue cooking the ribs for another 45 minutes. After 30 minutes, set one of the oven racks to the middle position and preheat the oven to 300° F.
Transfer the ribs to the wire rack fitted in the rimmed cookie sheet, as shown in the photo below. Add two cups of water to the pan. Brush the meat side of the ribs with another 2 tablespoons of the vinegar/cider mix. Carefully set the pan on the middle rack and continue cooking the ribs for one hour. 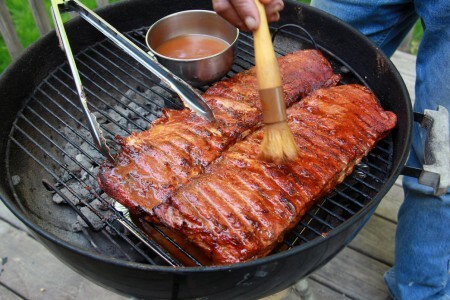 Brush the ribs with another 2 tablespoons of vinegar/cider mix. This will be for final mop brushing. Continue cooking the ribs until the thickest meat reaches 190° F. Remove the pan from the oven and cover the ribs with loose tent of aluminum foil. After a 15-minute rest, cut the ribs between the bones and serve. Note: St. Louis-style spareribs are the best ribs for this formula. These ribs are trimmed of the excess belly fat, cartilage, and skirt meat found on regular spare ribs. No additional trimming is necessary. Baby back ribs are too lean and usually become very dry during the extended cooking procedure outlined in this formula. The photo below shows the most efficient grill set up for barbequing these ribs. The most effective set up for transferring the ribs from the grill to the oven. It is time to eat and enjoy first class barbecue.